The new Apple Books reading app is now available to iPhones and iPads in the iTunes App Store. This app replaces the former iBooks app and is what iOS users will use moving forward for consuming books and other materials. Some of the new features include a Reading Now tab, which is a collection of the books being read or listened to by users. The Want to Read tool lets people manage wishlists of books, while the Complete the Series function offers suggestions based on previously read books. Apple Books more prominently calls out audiobooks, simplifying the process of listening on an iPhone, iPad, or via CarPlay. The Book Store tab includes new ways to browse via best-seller charts, staff picks, editorial recommendations, and special offers. 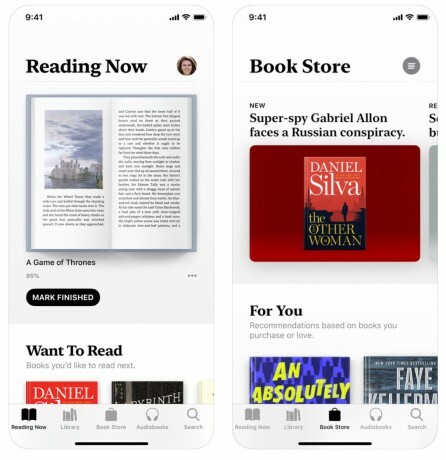 Apple says the more people browse, buy, read, and listen via the app, the better the Apple Books store will be able to offer personalized recommendations. The new Apple Books app requires iOS 12, which was distributed to iPhones and iPads earlier this week. Apple has a brand new reading app in store for iPhones and iPads later this year. The company offered a brief look at the new Apple Books app during its recent Worldwide Developers Conference, but is now more fully revealing the app and its features. Apple today announced iOS 12, its next-generation platform for the iPhone and iPad. Apple says it spent time improving the performance of the operating system, which in claims will work well on iPhones and iPads that went on sale as far back as 2013. Amazon today announced Prime Reading, a new benefit for subscribers of Amazon Prime that provides a selection of free books, magazines, and comics each month. Amazon says Prime Reading includes access to more than one thousand popular books, the latest magazines, and exclusive short content all presented within the Kindle app. Google today launched a new "Discover" tool within its Google Play Books app and service. Google says the tool is meant to help people find new books based on their interests and what's popular around the web.